Agriculture activities in Rigo District of Central Province can now withstand drought and climate change effects following the launch of the ChildFund PNG’s Adaptive, Resilient and Productive Agriculture in the Kwikila today. 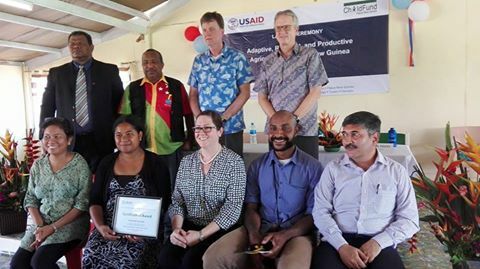 The Project was launched by US Embassy and ChildFund PNG in the presence of the Officials from the Climate Change and Development Authority, NARI and the Rigo District Administration and Communities including women and youths. ChildFund PNG’s Country Manager Manish Joshi said the projects objective is to strengthen the capacity of farmers of 12 communities in Rigo District which were badly affected of the el-nino to improve food security. He said the project will involve all members of the communities in the District especially the youths in becoming champions in addressing climate change issues in the District. Mr Joshi said the Project is a two year project funded by USAID’s Pacific American Climate Fund at the cost of US$512, 045 (K1.2million) and will be completed by November 2017. “ChildFund PNG will be building two nursery blocks for drought resistant crops and will be distributing seedlings to members of the communities to plant for food and also providing awareness and education on how to go about planting them so the crops could withstand extreme weather conditions”, said Mr Joshi. Deputy Chief of Mission from the US Embassy Mr Joel Maybury said the ChildFund PNG’s Adaptive, Resilient and Productive Agriculture Project in Rigo District is a 3rd Grant and 2nd Cycle of the USAID’s Pacific-American Climate Fund (PACAM) in assisting Pacific Island Nations in addressing climate change impacts. Mr Maybury said the US Government is very supportive of PACAM’s projects in identifying, developing and creating solutions to countries and communities to be adaptive to climate change. “On behalf of the US Embassy and the people of America, I am very grateful to you, the people of Rigo District and ChildFund PNG in implementing this very important project that will benefit the many of you in your farming and agriculture activities to improve food security during this el-nino weather conditions,” he said. Meanwhile Chairman of RIGO Central and Mainland Farmers Corporative Society Mr Kevin Mabone said the communities are very appreciative of the project as it will now greatly assist Agricultural Activities in the District. Mr Mabone said food security is a major issue affecting the people as most people lose their gardens to bushfires and also most dried and died out following the el-nino. He said the el-nino condition continues in the province after very little rain in early January this year and most food and water sources have dried out.